The fire broke out in an art gallery on Exeter's historic Cathedral Yard in the early hours of Friday morning. Statement from Hotel owner Andrew Brownsword. "My family and I have witnessed the events that unfolded since Friday with great sadness. The Royal Clarence Hotel has long been a special place for us all, and to see the building now is heart-breaking. "Alongside many of Exeter’s residents and visitors, we share a huge sense of loss of such an iconic building, and remember fondly our memories of happy times there. Amidst the tragedy, I have been reminded of the commitment, professionalism and dedication of so many people, and I would like to thank everyone for their overwhelming support. "Hotel general manager John Badley and his team not only fulfilled the most important function they could have done by ensuring all guests and staff were evacuated safely, but have since continued to offer help and support to all guests in a positive and extraordinarily professional manner. I am extremely proud of all the team. "I would also like to thank the city of Exeter and the many, many people who have helped us since the events of Friday. We are so grateful for the incredible efforts of the emergency services, especially the fire service who attended in huge numbers to assist in the effort to save The Royal Clarence and surrounding buildings. We’d also like to extend our thanks especially to the Council and to The Mercure Southgate Hotel, who offered every assistance to help both our staff and guests including refuge and temporary office space. "Looking to the future of The Royal Clarence, we have every intention to rebuild the hotel with enormous sympathy to its importance and heritage, and to make it once again a building that the City of Exeter will be proud of. "We have always said we believe we are merely custodians of the buildings our hotels operate within, and we pledge to do our very best to return The Royal Clarence to the city of Exeter and its people". Structural engineers will examine the remains of the Royal Clarence Hotel, after it was destroyed by fire. Firefighters have remained at the scene overnight, damping down hotspots. 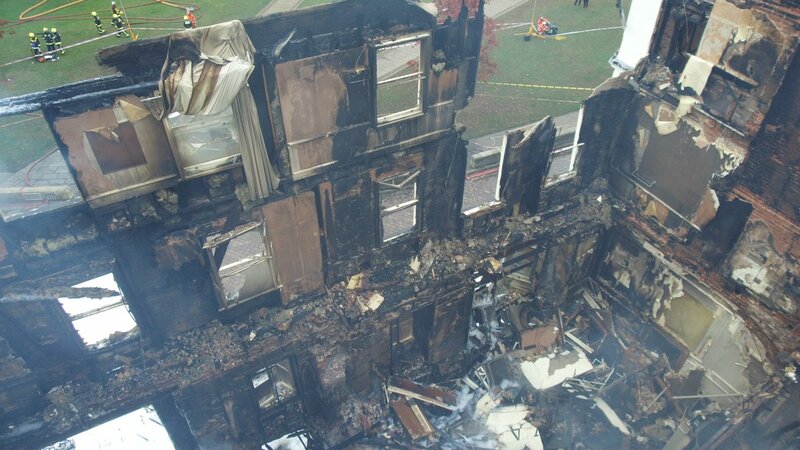 Devon and Cornwall Police drones have been helping the fire service, providing video footage and pictures. 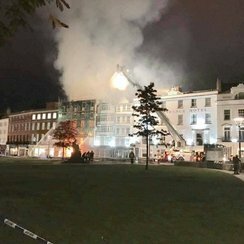 Devon and Cornwall Police has asked the public to appreciate the scale and severity of the fire which has affected buildings on Exeter’s Cathedral Green and to carefully consider their travel plans by car or public transport to Exeter’s city centre. There will also be disruption to walking routes, and police ask the public to respect the cordons that have been put in place for their safety and to allow the fire service to work efficiently. The public cannot for the time being enter or get closer to the Cathedral Green. Fire crews were called to the area at 5:12am after a large number of calls from the public. The fire broke out in the building which houses Laura Ashley and an Art Gallery. The Abode Royal Clarence hotel, next door, was evacuated, and all staff and residents have been accounted for. The fire spread to the roof of the hotel. There are currently more than 100 firefighters at the scene, and Police have closed surrounding roads. Princesshay and Guildhall shopping centres can be entered, but not from the High Street side. Devon and Somerset fire and rescue service say they do not yet know how the fire started, and there have been no reported injuries.